Theft crimes, in their many forms, are one of Georgia’s most common offenses. Theft is categorized into two main categories, felony and misdemeanor. Misdemeanor theft may be prosecuted by Municipal, Magistrate, or State courts. Felony theft is prosecuted in Superior court. You need an attorney that has experience handling cases similar to yours in the city or county that is bringing the charges. Attorney Dean Phillips has experience in all forms of theft crimes in Cobb County, Paulding County, Cherokee County, Bartow County, Marietta, Smyrna, Woodstock, Dallas, and Cartersville. 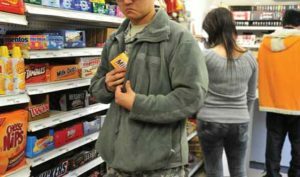 Shoplifting is the most common theft offense. A person commits shoplifting if he or she or in concert with another person deprives a store owner of merchandise without paying the full amount due to the store owner. Shoplifting less than $500 is a misdemeanor. Shoplifting greater than $500 is a felony. Value is determined by retail price of the property stolen. Therefore, it is incredibly important to retain Dean Phillips, a skilled criminal defense lawyer, to determine if you are wrongfully charged with a felony. If less than $500, the judge may sentence up to one year in jail or a combination of jail and probation. In Cobb County and most other courts, the judges generally order the defendant to pay restitution. This means that the defendant would have to repay the amount stolen from the store. A critical aspect of shoplifting comes immediately into play once you retain The Phillips Law Firm. Dean Phillips determines whether you have prior theft convictions. If not, you are likely eligible for pretrial diversion. The prosecution drops charges for clients who successfully complete the diversion program. Most diversion programs consist of a small fee, community service, and a shoplifting seminar. After the prosecutions drops the charges, your criminal record is washed clean. You may tell employers that you have never been convicted of shoplifting and your arrest record essentially disappears. Upon a second conviction of shoplifting, the judge must fine the defendant at least $250 and may imprison him or her for up to one year. The second and subsequent shoplifting conviction requires a fine. A third conviction requires at least 30 days in jail or 120 days in boot camp or house arrest. A fourth or subsequent shoplifting conviction is a felony, even if the amount stolen is less than $500. In this instance, the judge must impose jail time of 1 to 10 years. The first year of jail time may not be suspended, meaning the defendant must serve at least one year. When at least $100 in property is taken from three separate stores in one county within a period of 7 days or less, the defendant will be charged with a felony. The jail time imposed for felony shoplifting is 1 to 10 years. The crime of theft by taking occurs when one unlawfully takes or deprives another of his or her personal property, regardless of the manner in which the property was taken. Attorney Dean Phillips attacks theft cases if the prosecution does not charge a client with the proper theft crime. For example, the prosecution may charge a client with theft by taking when the proper charge is theft by receiving. In certain situations, an experienced criminal lawyer can get the improper theft by taking charge dismissed. Additionally, a defense attorney can sometimes get a felony theft charge reduced to a misdemeanor. O.C.G.A. § 16-8-12(a)(1) provides that a judge may reduce certain felony charges to a misdemeanor. Presenting a client’s case properly to the judge is crucial when requesting a reduced charge. The pretrial diversion program is also available to first-time offenders in both felony and misdemeanor cases. Dean Phillips will determine if you are eligible for diversion. Upon successful completion of the diversion program, your charges are dismissed. Theft by receiving stolen property is most often simply referred to as theft by receiving. This crime occurs when one receives, disposes of, or retains stolen property which he knows or should have known was stolen. The term “receiving” means acquiring possession or control. Theft by receiving is known as a specific intent crime, which means that in order to be guilty of the crime, the prosecution must prove the actual intention or knowledge possessed by the individual. This is a great area for a criminal attorney to attack. Dean Phillips has success defending cases where the prosecution could not prove clients knew or should have known property was stolen. The Phillips Law Firm has seen an uptick in theft by conversion charges, particularly in Cobb, Paulding, and Cherokee Counties. Attorney Dean Phillips most commonly represents clients charged with theft by conversion when an individual does not timely pay for lease-purchase goods, such as furniture or electronics. Lease-purchase stores too frequently and wrongfully apply for criminal warrants when an individual does not pay on time. The Phillips Law Firm is of the opinion that this is a civil matter, not criminal. Therefore, we enjoy the opportunity to aid clients in conversion cases. 5) The defendant promises services that he or she does not intend to perform. These five categories of intentional deception are often vague. Criminal attorney Dean Phillips attacks ambiguities in the law and the facts of each client’s case. A strong defense can result in reduced charges, dismissal, or a not guilty verdict. Mr. Phillips represents clients charged with all types of shoplifting and theft crimes in Marietta, Cobb County, Paulding County, Bartow County, Acworth, Austell, Powder Springs, Smyrna, Kennesaw and Woodstock. For a free consultation on shoplifting defense or felony theft defense, call 770-415-0933. Payment plans are also available.